You don’t have to look for something exotic to make an interesting photograph. Sometimes it’s just something as simple as the play of light that creates an eye-catching scene. 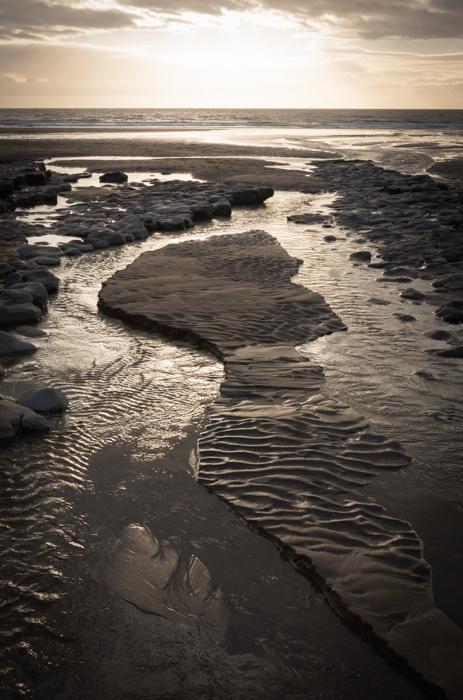 Here, the setting winter sun is highlighting the sheen of the water and the wet sand, and that, in stark contrast with the deep shadows, makes the shot. This photograph was in fact taken just over the Bristol Channel from my Somerset base, in South Wales; Southerndown, to be precise – a short hop over the Severn Bridge. However, this location is so close that you can see the Somerset coast just over the water – though not in this shot, which is not quite looking in the right direction for that – and the area shares many of the same geological features.